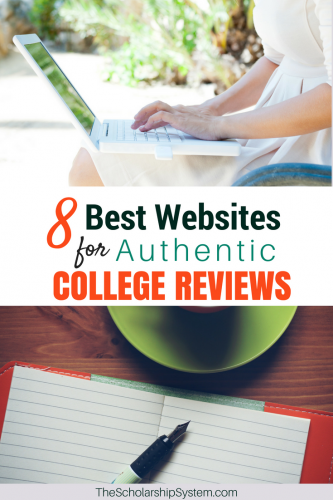 Finding authentic college reviews can be a challenge. Whether your child wants to find out about the “real” cost of attending, what the culture is like, or if students enjoy their experience, a quick online search isn’t always going to yield great results. Regretfully, the college reviews landscape is filled with fake reviews and websites operated by companies with secondary interests, including active associations with specific institutions, kickback or commission arrangements, and other incentives to suppress negative reviews to make schools look good. So, if your child needs authentic college reviews and reliable information, where should they turn? To help them get started, here are eight websites that can provide them with what they need to find. Looking for a complete college prep checklist for your high school student? Click the link based on your student’s grade below! While not officially a college reviews resource, the university’s website still has a lot of valuable information. Your child can look at various facilities and gauge the school’s culture. In some cases, video tours can be found on these sites, letting your student view more than can be contained in a single photo. It is important to only consider the information here as a starting point and not the only source of details about an institution. Colleges go out of their way to make their school look enticing to prospective students on their website, so this may not be the most realistic picture. However, it is worth your child’s time to check out these resources. One of the biggest names in college reviews is StudentsReview. While the website’s design isn’t fancy, reminiscent more of the appearance of Craigslist than Yelp, the information can be valuable. Students can provide reviews on their schools without being censored. Over 230,000 college reviews are featured, covering more than 4,400 institutions. Since the reviews are uncensored, it’s important to realize that some of the words and phrases may be offensive. However, it’s the unrestricted nature of the site that can help your child gain real insight into their potential college experience. Another site that doesn’t censor college reviews is CollegeTimes. The website is visually more attractive than StudentReviews, and its database is actually bigger too. Plus, the site actively removes fake reviews placed by marketing employees representing the schools, helping to ensure that the information they provide is genuine. In comparison to the two above, GetEducated is a bit of a niche site. They focus solely on over 1,100 online schools, so you won’t find details about brick and mortar options here. However, the information about whether a school may be a “degree mill” is incredibly valuable. GetEducated tracks over 300 fake online universities, pointing out which ones aren’t accredited or don’t provide a suitable education. If your child is considering an online degree, the college reviews section of GetEducated is a must-read. When it comes to college reviews, The Equality of Opportunity Project takes a unique approach. The examine schools to determine how they impact a student’s upward mobility, taking a close look at how children from low-income families faired after graduation. They even compare the earnings outcomes across the schools, showing that an Ivy League education might not be necessary for achieving high incomes. Since obtaining a degree is essentially an investment in your child’s future, their college reviews are worth exploring. While you won’t find student reviews on BigFuture, you can access incredibly comprehensive overviews about nearly every college in the country. Details about the graduation rates, school size, average financial aid package, majors, campus life, and so much more can be found on BigFuture, making it an excellent resource. Plus, your child can search for schools based on a variety of factors, including location, area of study, and even cost. If your student heads over to College Confidential, have them bypass the school searches and head straight into the forums. Users provide some genuine and honest feedback in a variety of threads covering a range of relevant topics. There are over 117,00 threads in the College Search and Selection category alone, plus a range of helpful posts discussing topics like “What Are My Chances” of getting into a particular school, examinations of college life, and even a forum for parents. You have to be a member to see the information, so that’s important to keep in mind. Additionally, some admissions reps make the rounds there. While some of their contributions are helpful, they may also intentionally paint things in a positive light, so take their input with a grain of salt. A creation of the National Center for Education Statistics (a government organization), College Navigator isn’t the prettiest site. However, it’s a great source for information on the schools. Your child can find details about degrees offered, student populations, tuition, graduation rates, outcome measures (how students faired after graduating), and more. Two points that are particularly interesting are the estimated student expenses and cohort default rates categories. Estimated student expenses includes costs that aren’t always easy to find information on, such as books and supplies, adding another dimension to the cost information. The cohort default rates showcase how many borrowers who entered repayment ultimately default, which is a surprising statistic to find. Your student won’t find any student-submitted college reviews here, but the information that is available is incredibly helpful. While not technically a college review site, social media can be a valuable source of honest opinions, as long as your child is willing to dig around. People can say nearly anything on social media, so doing basic searches on school names can yield some intriguing insights. However, it’s also a bit like the wild west, and there are few ways to see if a college review is accurate. If your student narrows down their list of potential schools, then they might be able to use Facebook or Twitter to help trim it down. Comments made on posts added by schools can be a great place to start, though it’s also wise to look for any relevant news related to the college to see if there is something worth noting. Regardless of whether the website collects college reviews from actual students or uses another rankings system, it’s always wise to be skeptical. Even big-name resources, like the U.S. News and World Report, have faced criticism for their approach to college reviews and rankings. Similarly, student reviews can provide valuable insights, but you generally don’t get much context behind their reviews. Some are fairly comprehensive, providing details about their experience, but others don’t, and one individual’s experience doesn’t guarantee every other student felt the same way. What sites have you used to learn more about universities? Please comment below with any we haven’t mentioned to help other families do their search! If you and your student would like more information about how to find scholarships sign up for our free college scholarship webinar! It’s an excellent way to receive some free training about locating scholarships and the rest of the process! The post 8 Best Websites for Authentic College Reviews appeared first on The Scholarship System. The United States admissions scandal: have any average trainees ever wound up at Oxbridge?